As part of the 200th anniversary of the birth of Frederick Douglass, a year celebrated not just in Rochester but across the United States, and around the world, Rare Books and Special Collections (RBSCP) at the University of Rochester used this year as an opportunity to expand and explore our collections as they relate to Douglass, building upon the rare and unique materials that are expected in an archive. We continue to identify and collect items such as letters written by Douglass, rare copies of his narratives and speeches, and cabinet cards of Douglass which, though he was the most widely photographed person of the 19th century, these images are incredibly difficult to find and prohibitively expensive to acquire. In 2018, the expanding and digitization of our Douglass holdings includes the acquisition of a vast selection of items that help to illuminate Douglass’s place in our hearts and minds and in history. Comics, children’s books, puppets, toys, games, dolls, costumes, and art, and more, all offer perspective and insight into Frederick Douglass as both a man, and as a legend. One major acquisition made this year, one that is somewhat unusual for an archival repository, were four pieces of contemporary by the internationally renowned artist Meleko Mokgosi. These four pieces, Untitled (Drawings for Frederick Douglass), were first exhibited in No Soil Better: Art + the Living Legacy of Frederick Douglass, which took place at Rochester Contemporary Arts Center (RoCo) at the beginning of 2018. No Soil Better presented artworks by a diverse group of emerging and established artists, all considering Douglass himself, how he has been memorialized, and the importance of his legacy today. 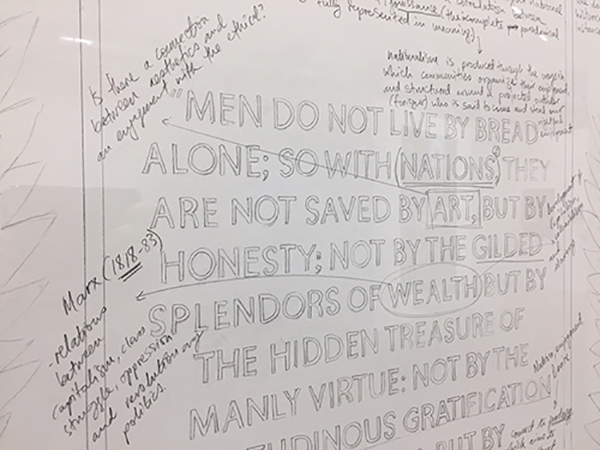 These four drawings by Mokgosi bring the artist’s textual editing practice to bear on the four monument panels that appear on the Douglass statue plinth. 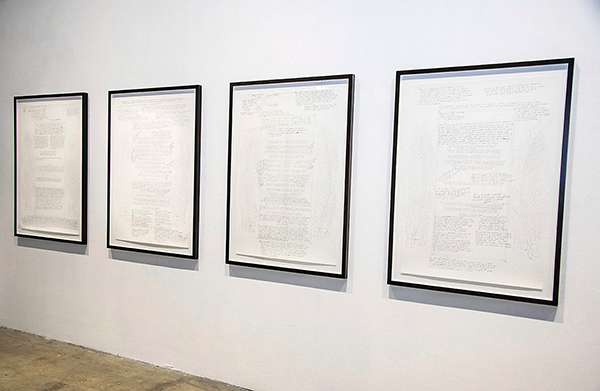 Each of the four large drawings depicts a plaque and layers of historical footnotes, expanded Douglass quotes, and additional biographical information. 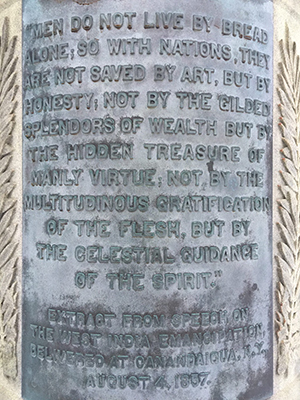 The artist’s probing questions and thoughtful marginalia offer a complex contemporary update to the original words cast in bronze. The Douglass statue is significant in many ways, as it is the first public statue erected in honor of an African American, and that original statue is in Rochester. The artist has used a text- and research-based drawing practice to engage deeply with Douglass and how his life and words have been memorialized. 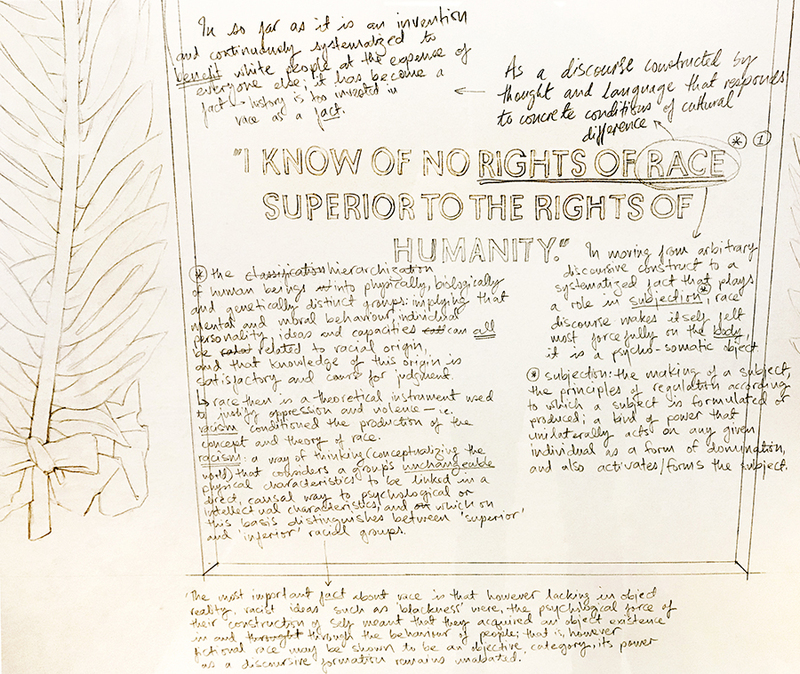 Mokgosi has redrawn the four monument panels that appear on the Douglass statue plinth, and in his own hand, layering on probing questions and thoughtful comments. Each annotated drawing contains footnotes, expanded Douglass quotes, and additional biographical details that offer a new, deeper reading. Mokgosi has received international attention for his finely rendered, mural-sized figurative paintings that explore the complexity of politics, history, and culture in postcolonial southern Africa, and has been shown at the Memorial Art Gallery. Mokgosi is also known for his works of textual editing, which perfectly bring his art from gallery to archive. The pieces were added to our exhibit, Rochester’s Frederick Douglass, Frederick Douglass’s World: Understanding the Man and His Legacy through Rare Books, Special Collections & Preservation in summer 2018, and will remain on display in the Seward Room in RBSCP.